A Southern California Premiere. 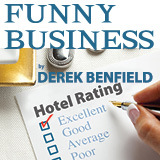 In this riotous sequel to Bedside Manners, Ferris agrees to look after his sister’s seedy hotel with its assortment of guests, all of whom have guilty secrets they do not wish divulged. The unexpected arrival of a notorious hotel critic/journalist complicates matters, and a dizzy round of lies and subterfuge ensues as Ferris attempts to protect the hotel’s reputation – a task made more difficult by the fact that he does not know which of his guests is the journalist!